Shape, one of the seven elements of art, is perhaps one of the best reasons why the visual arts should take center stage in any mathematics classroom. Discover how we used Paul Klee’s shape-filled Castle and Sun (1928) as a springboard to implementing a multi-faceted art lesson that allowed kindergarten students to explore mathematics (geometry, counting, and graphing), and which also provided opportunities for reading and writing. 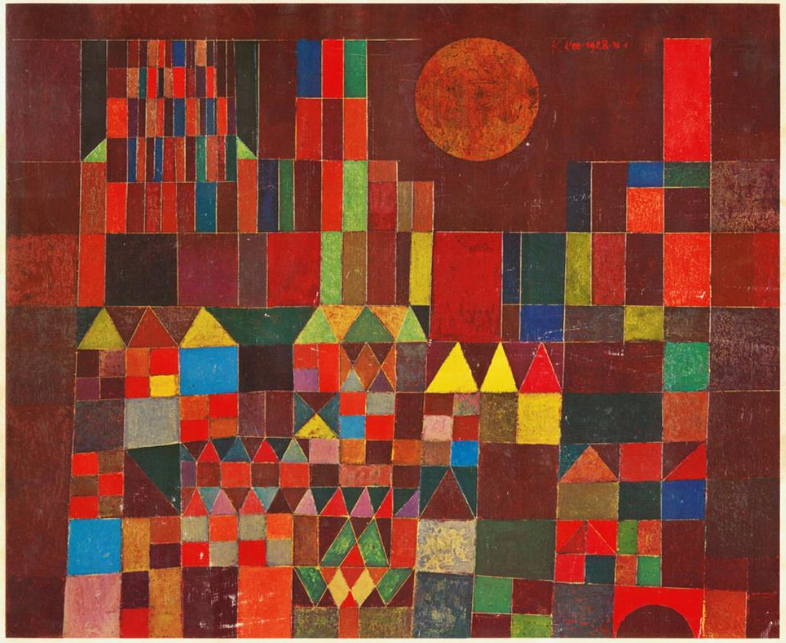 Painted in 1928 by the Swiss artist, Paul Klee, Castle and Sun (Figure 1) is a colorful oil work featuring abundant shades and shapes, cleverly arranged on a canvas with a lone orange sun shining in the deep red sky. Many triangles, rectangles, and squares comprise this abstract form of a city scene whose colors were inspired by Klee’s earlier trip to the northern African country of Tunisia. This masterpiece masterfully embodies expressionism, cubism, and abstract art. To start the lesson, our class met on the carpet where we read several excerpts from a variety of books about castles (see references for more information), so they could learn about the overall architecture of a castle, including the building materials used in constructing a castle, its interior and exterior layouts, the rooms in a castle, the functionality of each room, etc. We allowed the children ample time to view and ask questions about the illustrations and images in the books, which would ultimately assist them in creating, coloring, building, and writing about their castles in the three centers. At one center, using markers and crayons, students traced onto a 9” X 12” piece of white cardstock a variety of 2D die-cut shapes, one at a time, starting from the bottom of their paper and working upwards. Once their Klee-like castle was constructed, they traced and colored a circular sun. 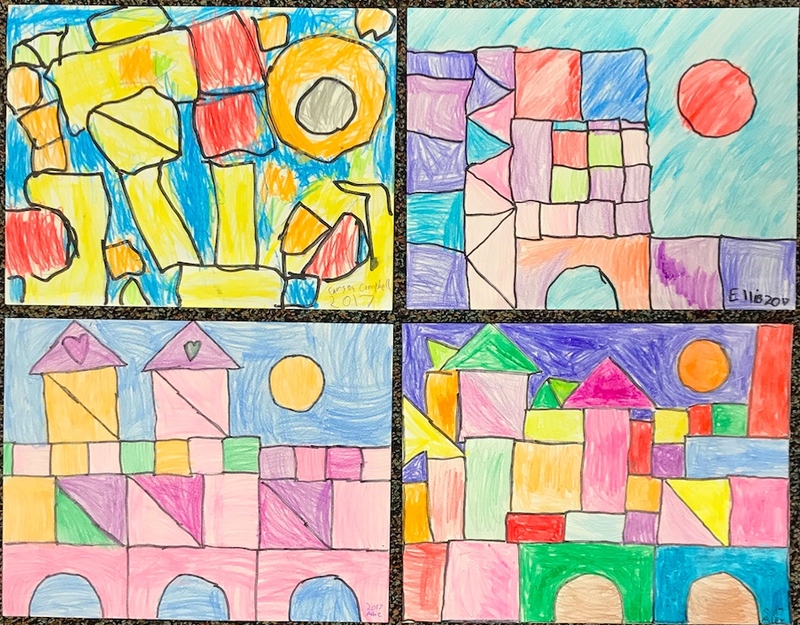 The students’ art contained the same shapes appearing in Klee’s masterpiece: varying sizes of triangles, squares, rectangles, and arches (Figure 2). We kept Klee’s Castle and Sun projected on the whiteboard and placed hardcopy images of this masterpiece at each station, serving as inspiration to the children as they worked. The students were also encouraged to visit the castle books to stimulate their imaginations. Put on Your Math Goggles! 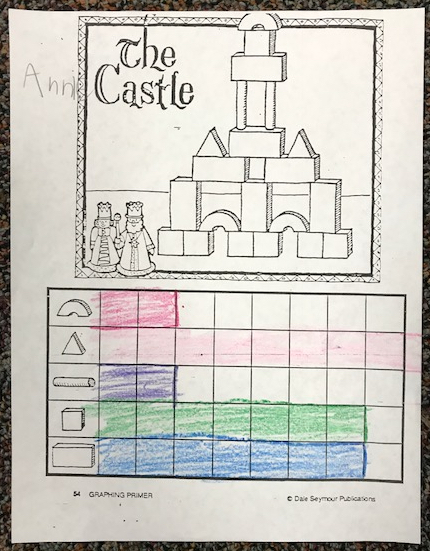 As the students constructed their colorful castles, this gave us the opportunity to ask students questions about the attributes of the traced shapes (e.g., number of sides, number of corners (or vertices), etc. ), as well as the names of the shapes. We also challenged their spatial-visual skills by asking which shape was above, below, to the right of, to the left of, etc., a specific shape. Further, we asked them to view their final products and discern what shape (or color) was used the most or least. At another center, we directed one child at a time to a corner classroom carpet where he/she constructed a castle using 3D wooden blocks (Figure 3). After the castle was built, we challenged each child to discuss any symmetry (a term that applies to both math and art!) they noticed in the castle’s architecture. After making their Klee-inspired castle sculptures, the children recorded on a bar graph the number of each type of shape used (Figure 4). This activity gave the children practice with counting, graph creation, and graph interpretation, as well as learning the names of the 3D blocks. At a third center, the children were provided with an additional artistic opportunity to express themselves and their imaginations by coloring a pre-printed castle. Below their castle art, the students articulated in a list fashion, so that they could gain practice with using commas, what their castle was made of in terms of its exterior and interior (Figure 5). 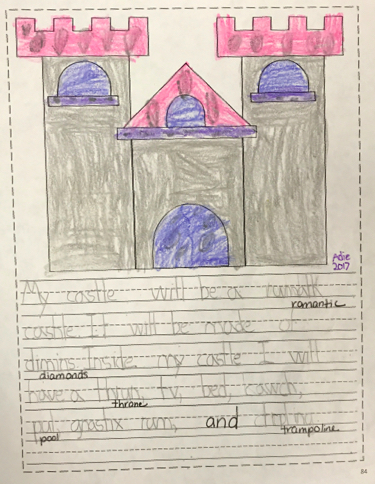 This required the children to reflect on what they had learned about castles in the books at the start of class, and to present their information in an organized fashion with a focus on proper punctuation. Since every castle in fairy tales seems to house a damsel in distress, we closed the lesson by reading Falling for Rapunzel by Leah Wilcox to the children, a hilarious spoof of the eponymous fairy tale. We also read Geraldine Elschner’s The Cat and the Bird, which is the title of a 1928 Klee painting. The book’s playful and brilliantly colored illustrations capture the spirit of Paul Klee’s art, and serve as the backdrop for a whimsical tale about a cat and a bird, and the notions of friendship and freedom. This beautifully illustrated book provided us one more avenue to allow the children to experience Klee’s expressionist art. 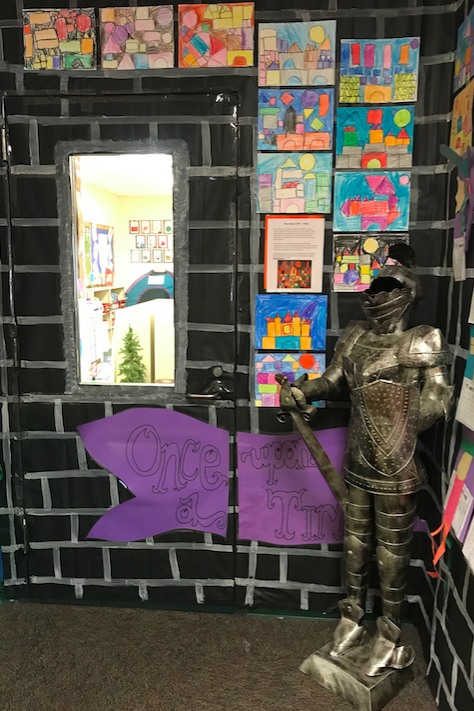 We mounted all of the children’s work completed during this integrated lesson onto large construction paper and then transformed the kindergarten hallway into a royal art gallery, showcasing the students’ artistic, mathematical, and written masterpieces (Figure 6). Enjoy our Klee castles…and construct and color your own! Bingham, J. (2004). The great castle search. New York: Scholastic. Elschner, G. (2012). The cat and the bird: A Children’s book inspired by Paul Klee. New York: Prestel. MacDonald, F. (2005). Knights and castles. Milwaukee, WI: Gareth Stevens Publishing. Star, F. (2005). Castle and knight (DK Eye Wonder). New York: DK Publishing, Inc.
Unstead, R.J. (1986). See inside a castle. London: Kingfisher Books Limited. Wilcox, L. (2005). Falling for Rapunzel. New York: Puffin Books. Figure 2. Kindergarteners create colorful Klee-inspired castles. Figure 3. 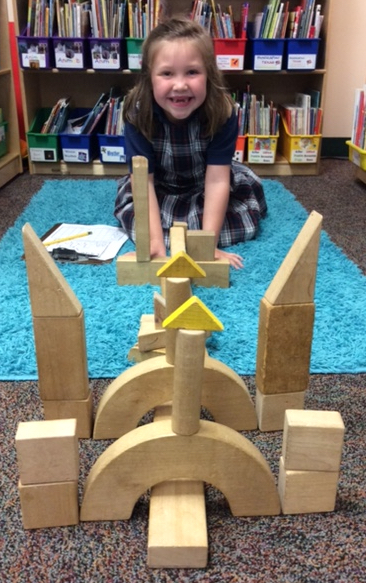 A joyful kindergartener proudly smiles at her castle sculpture. Figure 4. A kindergartener’s bar graph, depicting the blocks used in her castle sculpture. Figure 6 and Header. A classroom hall is turned into a royal Klee art gallery.